Another year...another grade! FIRST GRADE!! I'm going to be straight up honest. Most of the time, the days seem very, very long with these four running crazy through our house. But then we hit a point like...the first day of a new school year...and I realize that this whole "raising quads" thing is going much faster than I should be okay with. Let's talk about the kids instead! Except first...I had a total mom fail and forgot to charge the battery in my good camera. Oh my stars, I was so frustrated with myself. So it looks like this post will be full of my finest cell phone photos because that's about all I had to work with in the moment. At the end of Kindergarten, Caleb really started to struggle. He knew that school as he was familiar with was coming to an end, and the future held the unknown of a new regular classroom teacher and a new special education teacher. It was all going to shift and he didn't know what it was going to shift to. It got rough enough that I was called up to school one morning, and sat on the floor of the staff bathroom, holding a sobbing, angry, terrified little boy who couldn't pull himself together for fear of what was to come. Thankfully, his special education teacher realized that one of the best things she could do for him was give him the gift of meeting his first grade teacher. Although the school doesn't assign teachers until the Friday before the new year starts (like 4 days in advance! ), she went to the school administration, and requested an assignment for him right away so that she could get him into that classroom and have him meet his teacher *before* he went home for the summer. The school administration immediately assigned him (and Ellie! ), and Caleb was able to meet Ms. Horner. In fact, Ms. Horner gave him a little jar of bubbles which pretty much made her amazing in his eyes! All that to say, we talked frequently about Ms. Horner all summer, and when it came time for Meet the Teacher Night and go to his classroom, he adjusted quite well. School has only been in session for a few days, but we haven't had to argue with him to go to school yet, so...major points there! Caleb also has a little friend from his special education classroom in his mainstream room, and was very excited to see him the first morning. Caleb has trouble connecting with other kids his age, so it was nice to see the two of them acknowledge and seem happy to see each other. Caleb is still in therapies or special education about 65% of his day. He also has a new special education teacher, who seems really wonderful and sweet. As for his specials teachers (art, physical education, music, computers), they all greeted him with great excitement and his Art teacher has asked if he'd like to be her helper again this year which he readily agreed to. The whole school takes such great care of our special education students (not just Caleb!). Watching them love on and interact with these kids as important and smart human beings gives me such hope as a mom. 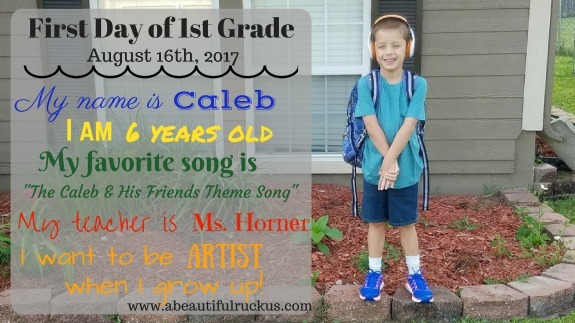 I'm looking forward to seeing how Caleb progresses this year with such a strong team of educators behind him. 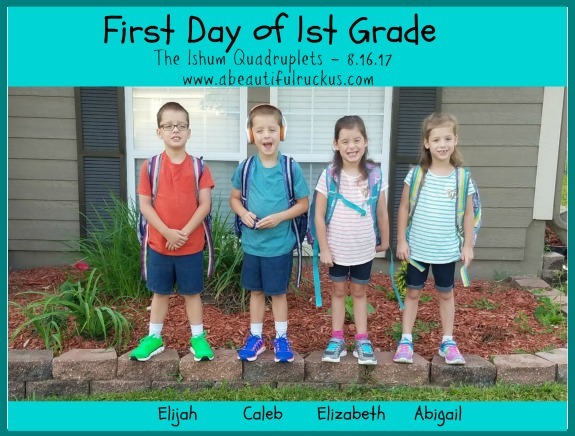 When they assigned Caleb, they also assigned Ellie, once again helping this mom out with two kids in two classrooms instead of four kids each in their own classroom. 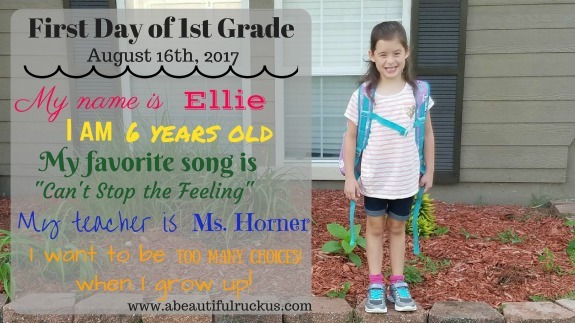 Ellie has declared Ms. Horner to be the most fun teacher she's ever had, and she absolutely adores her! Even better? Ellie's best friend is in her class! It's pretty much a dream come true for this kid on every point! Ellie...ever the life of the party! Probably her biggest struggle last year was not talking when she needed to be working. She just loves people so much she "can't help it!" The one big difference for Caleb and Ellie this year is that they are sitting next to each other at neighboring desks. Our two kids with the strongest personalities. Haha! It will either be perfect as neither one cares to listen to or follow the other one...or a total disaster. Stay tuned for how that plays out! Elijah is down to just speech therapy at this point. 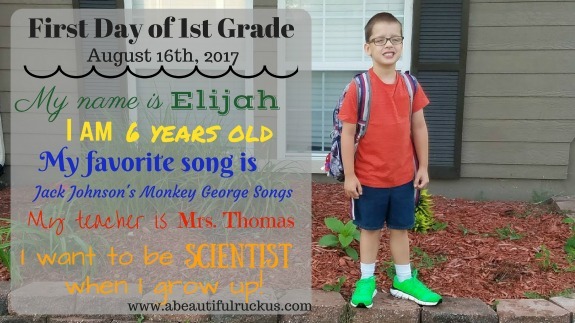 All other therapies and interventions have been discontinued, and Elijah continues to do so well academically! He is sporting his new glasses and has been pretty laid back about the whole "back to school" idea. He wasn't too worried about Meet the Teacher Night and was totally cool on the first day of school. He is our super compassionate kid, and adores all things creative. He colors, cuts, and glues for hours at home as he makes his art, and I think as long as first grade incorporates some of that, he will be happy! Abby and Elijah are both also sitting next to each other in Mrs. Thomas' class. Last year they were on opposite sides of the room. I'm thinking that won't be too much of an issue as they don't usually try to tell each other what to do. While the other kids weren't too crazy nervous about school starting up, Abby was the exact opposite. She has some major anxiety and social/emotional issues still, and the thought of an unknown teacher in an unknown grade was cause for some sleepless nights and tummy aches (her anxiety manifests as tummy trouble). She cowered all the way to her new classroom on Meet the Teacher night, and I thought she actually might make a break for it (she strongly adheres to the "flight" in her fight or flight response). We managed to get her all the way to her classroom where the school had assigned her to quite possibly the best hand-picked teacher ever. Mrs. Thomas is very quiet but has a *very* grounding and calming presence. Abby was absolutely drawn to her and immediately connected with her on the spot. It was like watching a magnet attract her. We have not had one single belly ache or nervous comment from Abby about school since then. Even on the morning that class started, Abby was eager to get to school and see her teacher again. I wish I could fully describe what happened in the brief moments that Mrs. Thomas and Abby spent together that first night. I was kind of blown away by it. 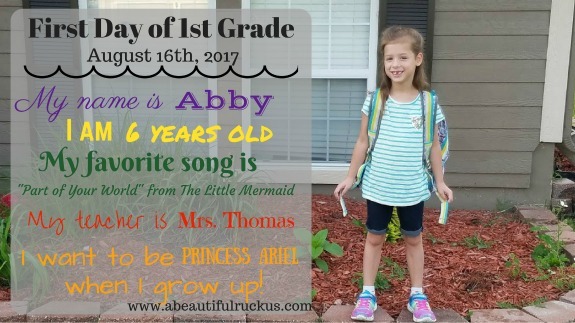 Mrs. Thomas did tell me that Abby had about 7 meltdowns on that first day of school, but that she was able to calm and ground her again each time. Unfortunately for Abby, she tested too high on paper to qualify as a kid with social/emotional needs officially, but she still does have very real delays in this area. I'm hopeful that between Mrs. Thomas' nurturing personality and Abby's extra year of growth, that Abby can make good headway in this area this year. I'm honestly excited for her to have this chance! So with that being said....this was the first day of school! It went well! 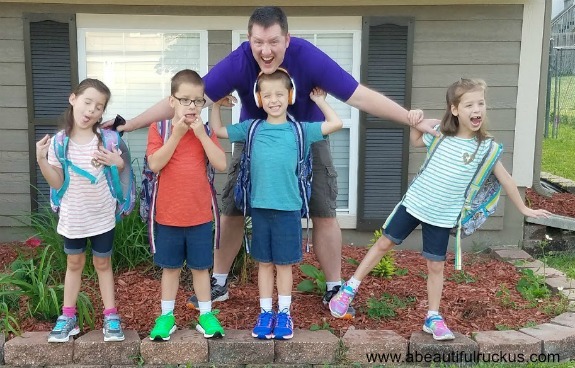 The kids got there on time, their teachers seem to be amazing and perfectly paired with our little ones, and I'm happy to be able to focus more on work with a few extra uninterrupted minutes during the day as we head into the fall. .....however, our second day had significantly more excitement than our first. That's a blog post all on it's own though. I'll get that up in the next couple of days, with bloody commentary and all. Haha...ugh. Until then, this is my family. and I love them. that is all.